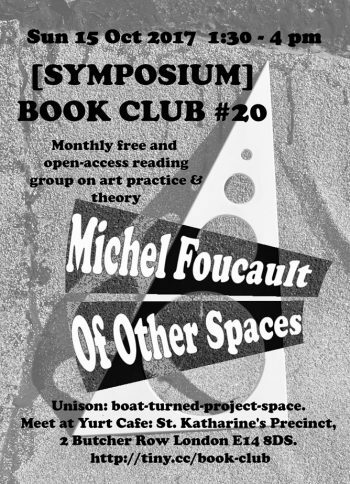 This book club will take place on Unison, a lifeboat-turned-project-space. We will meet at Yurt Café, located next to Limehouse station, between 1:30pm and 2pm and walk to the boat moored nearby. DOWNLOAD Foucault, Michel (1986). Of Other Spaces, trans. Jay Miskowiec. Diacritics, 16/1 (Spring 1986), pp. 22–27. Originally published as Des Espace Autres (Conférence au Cercle d’études architecturales, 14 March 1967). Architecture, Mouvement, Continuité, No. 5 (October 1984), pp. 46-49. [SYMPOSIUM] BOOK CLUB#20. Flyer by Dasha Loyko. The definitions of heterotopia given by Foucault contrast it with utopia. Utopia, for him, is an idealized model of society that does not exist in the world. Heterotopia, on the contrary, is a kind of actualised utopia, it is a real space but one that represents, contests and inverts other sites within society. Some of the examples he gives include the reflection in the mirror, the cemetery, the museum, the motel. Foucault views these spaces as microcosms where the usual social and technological rules do not apply, yet they structure and shape our perception of our own urban geography. The term ‘heterotopia’ was first used by Michel Foucault in the preface to The Order of Things (1966) as a non-place, as something disturbing that has power to subvert language. He later discussed it in a twelve-minute radio broadcast, expanding his definition. To Foucault’s surprise (as he may not have intended a practical application to the idea), he subsequently got asked to repeat the lecture in front of an audience of architects in 1967. The paper we are reading is a transcript of that lecture. Within the text, Foucault makes an important reference to Gaston Bachelard, whose 1958 book ‘Poetics of Space’ provides key context for the idea of heterotopia. In the book, Bachelard elaborated his ideas of applying phenomenology to architectural spaces, or, in other words, urged architects to develop buildings based on the lived experienced within enclosed or domestic spaces, on the emotional response to them, rather than on purely utilitarian or theoretical grounds. Heterotopia remains a concept that Foucault never fully elaborated, yet it has, since the 60’s up to the present day, been appropriated, interpreted and re-interpreted by architects, theorists of the public space and artists alike. The final passage of the paper concludes that ‘the ship is the heterotopia par excellence. In civilisations without boats, dreams dry up, espionage takes place of adventure, and the police take the place of pirates’. This book club will take place on a former lifeboat that now functions as a project space. It was founded by Anastasia Freygang ‘to create a shifting pocket of enquiries’. Moored at Limehouse, we will discuss some of the following questions and talk about the significance of the idea of heterotopia in relation to public spaces, institutions and our own lived experience. why does Foucault call our (or his) time an ‘epoch of simultaneity’, and an epoch of space rather than time? how is a mirror both a utopia and a heterotopia? what is the relationship between utopia and heterotopia? how can the concept of heterotopia be related to the notion of public space? does the idea of heterotopia survive in the age of augmented and virtual reality and the internet? Dasha Loyko is an artist. Johnson, Peter (2006). Unravelling Foucault’s ‘different spaces’ in History of the Human Sciences 19:4, pp. 75-90. SAGE Publications. Foucault, Michel (1994). The Order of Things (Preface). New York; Vintage Books. Bachelard, Gaston (2014). Poetics of Space. New York; Penguin Books. Sorkin, Michael (1992). Variations on a Theme Park: The New American City and the End of Public Space. Hill and Wang. Borges, Jorge Luis (2000). The library of Babel. in Fictions. Penguin. Borges, Jorge Luis (2000). The Garden of Forking Paths. in Fictions. Penguin.